The National Flag is divided diagonally into two equal halves. The upper yellow half signifies the secular power and authority of the King while the lower saffron-orange symbolizes the practice of religion and the power of Buddhism manifested in the tradition of Drukpa Kagyu. The dragon signifies the name of the country, and its white colour signifies purity. The jewels in its jeweled claws stand for the wealth and perfection of the country. 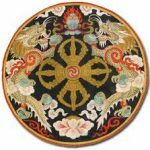 The National Emblem of Bhutan is a circle that projects a double diamond thunderbolt placed above a lotus. The thunderbolt represents the harmony between secular and religious power while the lotus symbolizes purity. 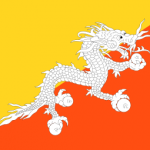 The jewel signifies the sovereign power while the dragon (male and female) represents the name of the country Druk Yul or the Land of the Thunder Dragon. National Anthem The national anthem was first composed in 1953. The National Anthem became official in 1966. The first stanza can be translated: In the kingdom of the dragon, the southern land of sandalwood, long live the king, who directs the affairs of both state and religion. Celebrated on 17 December, the National Day commemorates the ascension to the throne of Ugyen Wangchuck, the first king of Bhutan at Punakha Dzong on 17 December 1907. The national language is Dzongkha. The name literally means language of the Dzong (the fortresses that now serve as the religious and administrative centres of the districts). The national animal is the Takin (Burdorastaxicolor) that is associated with religious history and mythology. It is a rare mammal with a thick neck and short muscular legs. It lives in groups and is found above 4000 meters on the northern-western and far north-eastern parts of the country. The adult Takin can weigh over 200 kgs. The national animal is the Blue Poppy (Meconopsis Grandis). 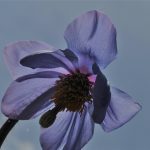 It is a delicate blue or purple tinged blosson with a white filament. It grows to a height of 1 meter, and can be found above the tree line (3500-4500 meters). It was discovered in 1933 by a British Botanist George Sherriff in a remote part of Sakteng in eastern Bhutan. The national tree is the cypress. Found in abundance all over Bhutan, one may notice large cypresses near temples and monasteries. The tree is found in the temperate climate zone, between 1800 and 3500 meters. The national sport is archery. It was declared the national sport in 1971 when Bhutan became a member of the United Nations. Bhutan also maintains an Olympic archery team. Archery tournaments and competitions are held throughout the country. 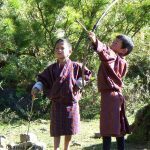 Archery is played during religious and secular public holidays in Bhutan and during local festivals (tshechus). The national dress of Bhutan is the gho (knee length attire tied at the waist) for the men and kira (ankle length dress accompanied by an outer jacket called tego and inner layer called wanju) for the women. Scarves known as kabney for men and rachu for women are worn when visiting important religious and administrative places.